Home Lawn Care Maintained – A New Trend – Looking Good Landscaping ""
That patch of lush, green grass you gaze at on your daily neighbourhood walk isn’t just pleasing on the eye. Healthy, well-looked after lawn has a multitude of benefits, many of which are the driving force behind why more people are taking their lawn care maintenance up a level and creating a new trend of thriving & bright turf taking centre stage in outdoor areas. Read below for some of the reasons why having flourishing lawn should be a priority for your home and stay ahead of this trend that isn’t going anywhere anytime soon! Property Value – A well maintained lawn can increase your home’s value by up to 15% at a minimum! Sound Minimisation – A lush lawn area can reduce traffic noise by up to 200% when compared with the same amount of concrete or similar type material such as paving. “Noise pollution” is a growing concern in urban areas and turf is one of the most effective ways around this apprehension in some neighbourhoods. Air Quality – Your lawn as a living entity soaks up the greenhouse gases around it and converts the carbon dioxide to additional oxygen; in fact the average sized lawn reduces carbon emissions enough to offset a car ride of around 174km AND does the work of over 28 trees! Sport & Recreation – Soft and green lawn is not only more aesthetically appealing for the average active enthusiast looking to get a sweat on but it also offers a safer surface for any potential falls, bumps or scrapes that may happen from the average outdoor workout session, home based yoga practise or group of children playing up a storm! The soil underneath a healthy area of grass has a naturally occurring good bacterium that automatically sanitises the grass, making it safe for all manners of sporting and recreation that the whole family can be a part of. Glare Reduction – Hard, shiny surfaces such as outdoor materials used for housing and paving can contribute towards extensive, harsh glare entering through windows and causing visual discomfort as well as prematurely wearing out painted and untreated surfaces. Soft, moist and healthy lawn with its irregular sized blades of grass significantly reduces glare through absorbing the excess within its mass. 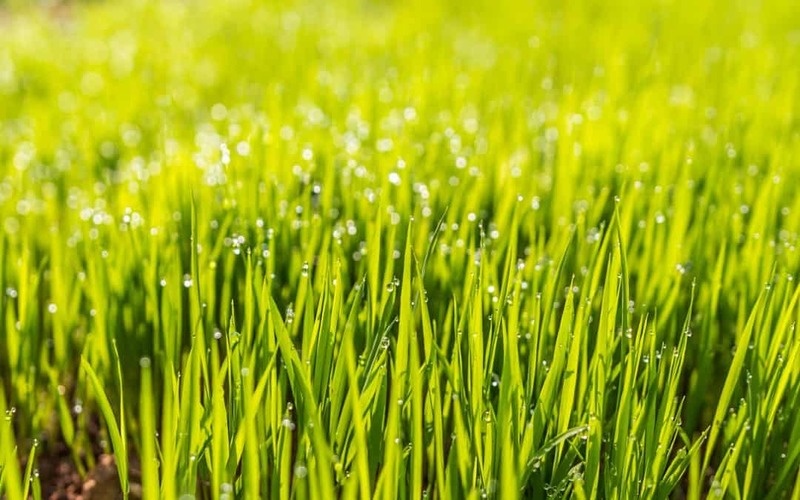 Clean Water – Healthy, lush lawn absorbs rainwater 15 times more than sparse, patchy grass and ensures that rainwater is effectively filtered through the dense blades and absorbed into the ground as opposed to running off into excess waterways. The rainwater makes its way to the immense underground water reservoirs where it helps towards maintaining high water levels and eventually becomes our drinking water. Here at Looking Good Landscapes, we LOVE healthy, lush, bright green lawn and we love it even more when we can help you to achieve it. We want you to enjoy your beautiful grassed spaces without counting down the minutes before you have to throw on the dreaded gardening gloves to keep it looking its best! With a variety of benefits, it’s no wonder flourishing lawn is a growing trend that more people are seeing as a worthy investment and we look forward to taking your lawn to its full potential.